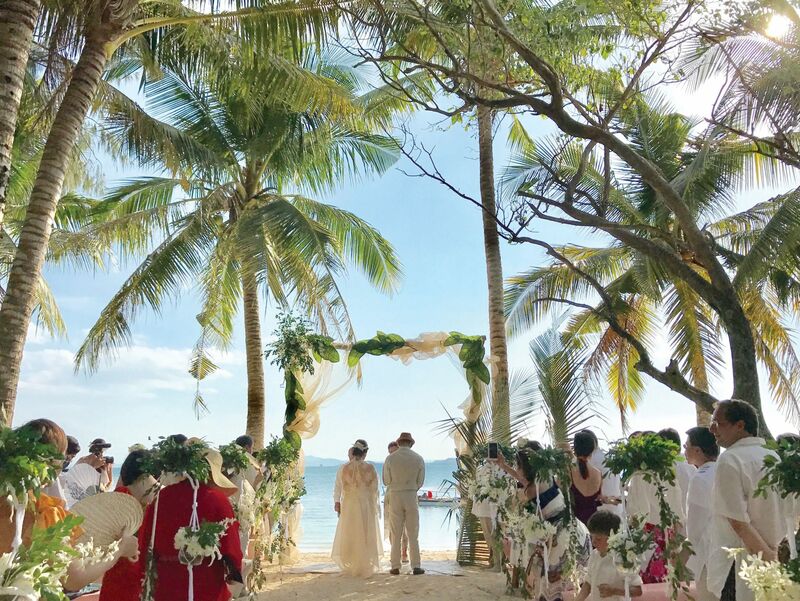 Unplugged and in the moment, on July 28 this year, my husband and I exchanged our vows before 80 of our loved ones in a slice of paradise—Guyam Island, Siargao. Our wedding weekend began on a sunny Friday when we welcomed friends and family with brunch at Harana Resort. We wanted to set the tone for the weekend and plug into Siargao’s signature laid-back mode. After Earl proposed to me last year, it took some time for me to imagine the type of wedding that I wished to have. When my then-fiancé brought up the idea of getting married in Siargao, the bells in my head finally started to chime. Authentic, spontaneous, joyful, and eco-friendly—those were the criteria which I chose to plan my wedding around. After Earl proposed to me last year, it took some time for me to imagine the type of wedding that I wished to have. When my then-fiancé brought up the idea of getting married in Siargao, the bells in my head finally started to chime. Authentic, spontaneous, joyful, and eco-friendly—those were the criteria which I chose to plan my wedding around. Crystal clear waters with the bluest of blue hues and the greenest of greens, Siargao was the wedding destination I had been waiting for. Over the last few years, Earl and I would spend our Holy Week holidays on Daku Island in Siargao. Some days we went island hopping and, others, we would kayak or try to catch the surf. On slower days we would simply soak up the sun and watch the tide roll in and out of the shore while enjoying the refreshing juice of coconuts. Come sunrise we would walk to the tip of the island—the locals call it the punta—where we would cool off with a sunset swim and watch the sky dance and fill with the most wonderful hues of blue, purples, oranges, and pink. One summer, I took a friend from Los Angeles to Daku’s punta and the sunset left her in tears. The colours of Siargao are magical—something one must experience in their life. As soon as we set the date, we sent out electronic save-the-dates. In an ode to be environmentally friendly, I chose to use e-invitations versus printed ones. My only two non-negotiables for the wedding were that the ceremony be on Guyam Island and that my favourite “Nanay’s lechon” (Mum's roasted pig) was to be served at the reception. Our welcome brunch at Harana gave us the opportunity to greet all our guests before the wedding day and at the same time share information about the schedules, boats, and other details for the wedding the next day. At Harana, we also distributed our wedding gift bags—colourful all-natural woven bags, which held a local pamaypay (fan), natural mosquito repellent, handwoven beach towels, and other practical party favours like our customised “hangover kit” made by my bridesmaid Pia Moras, which we filled with snacks, vitamins, and remedies to aid in the next day’s recovery. Earl and I just tied the knot! On our wedding day, the sun was shining and the weather was perfect. We celebrated our union under the coconut trees of Guyam Island in front of a pastor and our closest family and friends. My entourage and I walked down in the creations of my mother, Lulu Tan-Gan, while the groom wore a bespoke linen suit by William Lee and his entourage wore Ivarluski Aseron. Seeing my bridesmaids in my mum’s creations was such a joy. After the ceremony, we sent our guests off in bangkas (outrigger boats) with refreshments and surf bread, a favourite local favourite snack. Since most of our guests had flown in just for the wedding day, we felt the need to show them what Siargao had to offer, so we included a surprise side trip to Naked Island—a sandbar with nothing else but white sand and cool waters—to the itinerary. At around 5 p.m., our guests headed to the reception venue, Bayud Boutique Resort, located on a private enclave along a stretch of white sand in Malinao. The sun was setting and the air was cooling down. Upon docking on the shores they were greeted with a local percussion band drumming away, native treats like Filipino ice cream, fruit shakes, empanadas, and an array of cocktails, and Bayud’s signature pica pica, curated by the resort’s co-owner and chef Rainier Barbers. As a surprise for the ladies, one of my godmothers, Tita Irene Araneta, gave out handmade flower crowns. The ladies were delighted! When the sun disappeared into the horizon, the full moon took over and lit the evening sky. As the night progressed, the wind kept blessing us with waves and waves of the most amazing breeze. We couldn’t have asked for better weather. To get the party started, my best friend, Xandra Rocha-Araneta hosted the festivities along with my husband, Earl. We played games, feasted, laughed, and cried during the speeches. As a gift t o Earl, I surprised him with a three-tiered caviar pie cake, a twist to his favourite caviar pie by our family friend Demitra Nassr. It was our second wedding cake and everyone loved it. After the acoustic French band, Gus and Jaco, finished their set, our friend D J Miro Grgic took over the turntables and we danced the night away. What I loved most about our wedding was that we were all reminded to live and love in the moment! I remember looking around and thinking “Wow, how refreshing—nobody is on their cellphone!” All our guests were so relaxed, laughing and simply enjoying themselves and each other’s company. One of my guests even said that that it felt like “Mamma Mia!” And it did! It was “Mamma Mia” and more!